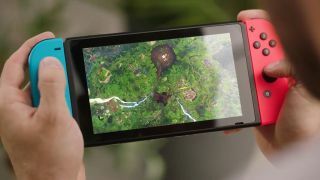 Good news for Nintendo Switch owners who've jumped aboard the Fortnite bandwagon — from Thursday, the Switch version of the incredibly popular Battle Royale shooter will be getting built-in voice chat functionality. Chatting on Nintendo's current hybrid console is admittedly a convoluted process — in order to talk with friends (and only friends, mind) in Splatoon 2 (Switch's most high profile online title to date), players must first download the Nintendo Switch Online app on their iOS or Android device, plug their headsets into said devices and chat through them exclusively. Thankfully, that won't be the case with the Switch version of Fortnite, which will be getting native party chat through the console's headphone jack from this Thursday, as was confirmed by developers from Epic Games during Nintendo's E3 2018 Treehouse Live stream today. As Fortnite: Battle Royale is a cross-play title, meaning players on Switch, Xbox One, PC and iOS are able to square off against each other (unfortunately, Sony is blocking Fortnite cross-play on Nintendo Switch), native party chat is pretty much essential for team games. We're glad that native voice chat has been made possible in this instance, but we have to wonder: if it's so easy to implement for Fortnite, why are players still forced to jump through a number of hoops in order to chat in other games? Hopefully, the fact that it's technically achievable will see Nintendo loosen its grip when it comes to party chat for online play in the near future.